Marketing Research or market research is a way to gather the information of market, customer, products, services and consumer behaviour with organized efforts. It is one of the key component of business strategic planning. The goal of marketing research is to providing facts about how changing elements of market mix like product, price, place and promotion impacts consumer behaviour. UDS’s marketing/finance databases makes it easy for non-technical users to prepare intricate selection for marketing purpose. Our database can be customized to suit the requirements of the clients. Key databases include: C-level contacts databases, India M&A database for last 10 years and State SME contacts. We help you finding distributors in foreign markets for your products. RNB Research is the definitive source for information about food and beverages consumed at-home and away-from-home in Asia. We monitor a wide range of critical trends in consumer behavior, attitudes, and usage motivators - from diet and nutrition to food safety and brand awareness. 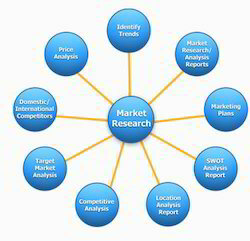 We Conduct Secondary Market Research & prepare Analysis Report: The Research and Analysis would be done through Secondary sources like Articles, Whitepapers, Search Engines(Google, Yahoo, AltaVista etc), Company's financial reports and other Proprietary Sources , We provide free Analysis and Recommendation which helps your business grow . The report shall be prepared in world class format.